Upon Napoleon's return to power in March 1815, many states that had opposed him formed the Seventh Coalition, and began to mobilize armies. Wellington and Blücher's armies were cantoned close to the north-eastern border of France. Napoleon chose to attack them in the hope of destroying them before they could join in a co-ordinated invasion of France with other members of the coalition. Napoleon successfully attacked the bulk of the Prussian army at the Battle of Ligny with his main force, while at the same time a portion of the French army attacked an Allied army at the Battle of Quatre Bras. Despite holding his ground at Quatre Bras, the defeat of the Prussians forced Wellington to withdraw to Waterloo. Napoleon sent a third of his forces to pursue the Prussians, who had withdrawn parallel to Wellington. This resulted in the separate and simultaneous Battle of Wavre with the Prussian rear-guard. Upon learning that the Prussian army was able to support him, Wellington decided to offer battle on the Mont-Saint-Jean escarpment, across the Brussels road. Here he withstood repeated attacks by the French throughout the afternoon, aided by the progressively arriving Prussians. In the evening Napoleon committed his last reserves to a desperate final attack, which was narrowly beaten back. With the Prussians breaking through on the French right flank, Wellington's Anglo-allied army counter-attacked in the centre, and the French army was routed. Waterloo was the decisive engagement of the Waterloo Campaign and Napoleon's last. According to Wellington, the battle was "the nearest-run thing you ever saw in your life". Napoleon abdicated four days later, and on 7 July coalition forces entered Paris. The defeat at Waterloo ended Napoleon's rule as Emperor of the French, and marked the end of his Hundred Days return from exile. This ended the First French Empire, and set a chronological milestone between serial European wars and decades of relative peace. The battlefield is located in the municipalities of Braine-l'Alleud and Lasne, about 15 kilometres (9.3 mi) south of Brussels, and about 2 kilometres (1.2 mi) from the town of Waterloo. The site of the battlefield today is dominated by a large monument, the Lion's Mound. As this mound was constructed from earth taken from the battlefield itself, the contemporary topography of the battlefield near the mound has not been preserved. On 13 March 1815, six days before Napoleon reached Paris, the powers at the Congress of Vienna declared him an outlaw. Four days later, the United Kingdom, Russia, Austria, and Prussia mobilised armies to defeat Napoleon. Critically outnumbered, Napoleon knew that once his attempts at dissuading one or more of the Seventh Coalition allies from invading France had failed, his only chance of remaining in power was to attack before the coalition mobilised. An additional consideration for Napoleon was that a French victory might cause French speaking sympathisers in Belgium to launch a friendly revolution. Also, coalition troops in Belgium were largely second-line, as many units were of dubious quality and loyalty, and most of the British veterans of the Peninsular War had been sent to North America to fight in the War of 1812. The resurgent Napoleon's strategy was to isolate the Allied and Prussian armies and annihilate each one separately. Wellington's initial dispositions were intended to counter the threat of Napoleon enveloping the Coalition armies by moving through Mons to the south-west of Brussels. This would have pushed Wellington closer to Blücher, but may have cut Wellington's communications with his base at Ostend. In order to delay Wellington's deployment, Napoleon spread false intelligence which suggested that Wellington's supply chain from the channel ports would be cut. By June, Napoleon had raised a total army strength of about 300,000 men. The force at his disposal at Waterloo was less than one third that size, but the rank and file were nearly all loyal and experienced soldiers. Napoleon divided his army into a left wing commanded by Marshal Ney, a right wing commanded by Marshal Grouchy and a reserve under his command (although all three elements remained close enough to support one another). Crossing the frontier near Charleroi before dawn on 15 June, the French rapidly overran Coalition outposts, securing Napoleon's "central position" between Wellington's and Blücher's armies. He hoped this would prevent them from combining, and he would be able to destroy first the Prussian army, then Wellington's. Many of the troops in the Coalition armies were inexperienced. [lower-alpha 1][lower-alpha 2] The Dutch army had been re-established in 1815, following the earlier defeat of Napoleon. With the exception of the British and some from Hanover and Brunswick who had fought with the British army in Spain, many of the professional soldiers in the Coalition armies had spent some of their time in the French army or in armies allied to the Napoleonic regime. The historian Barbero states that in this heterogeneous army the difference between British and foreign troops did not prove significant under fire. The Prussian army was in the throes of reorganisation. In 1815, the former Reserve regiments, Legions, and Freikorps volunteer formations from the wars of 1813–1814 were in the process of being absorbed into the line, along with many Landwehr (militia) regiments. The Landwehr were mostly untrained and unequipped when they arrived in Belgium. The Prussian cavalry were in a similar state. Its artillery was also reorganising and did not give its best performance – guns and equipment continued to arrive during and after the battle. The initial attack by Bauduin's brigade emptied the wood and park, but was driven back by heavy British artillery fire, and cost Bauduin his life. As the British guns were distracted by a duel with French artillery, a second attack by Soye's brigade and what had been Bauduin's succeeded in reaching the north gate of the house. Sous-Lieutenant Legros, a French officer, broke the gate open with an axe, and some French troops managed to enter the courtyard. The 2nd Coldstream Guards and 2/3rd Foot Guards arrived to support the defence. There was a fierce melee, and the British managed to close the gate on the French troops streaming in. The Frenchmen trapped in the courtyard were all killed. Only a young drummer boy was spared. Fighting continued around Hougoumont all afternoon. Its surroundings were heavily invested by French light infantry, and coordinated attacks were made against the troops behind Hougoumont. Wellington's army defended the house and the hollow way running north from it. In the afternoon, Napoleon personally ordered the house to be shelled to set it on fire,[lower-alpha 6] resulting in the destruction of all but the chapel. Du Plat's brigade of the King's German Legion was brought forward to defend the hollow way, which they had to do without senior officers. Eventually they were relieved by the 71st Foot, a British infantry regiment. Adam's brigade was further reinforced by Hugh Halkett's 3rd Hanoverian Brigade, and successfully repulsed further infantry and cavalry attacks sent by Reille. Hougoumont held out until the end of the battle. — Major Macready, Light Division, 30th British Regiment, Halkett's brigade. Map of the battle. Napoleon's units are in blue, Wellington's in red, Blücher's in grey. The 80 guns of Napoleon's grande batterie drew up in the centre. These opened fire at 11:50, according to Lord Hill (commander of the Anglo-allied II Corps),[lower-alpha 7] while other sources put the time between noon and 13:30. The grande batterie was too far back to aim accurately, and the only other troops they could see were skirmishers of the regiments of Kempt and Pack, and Perponcher's 2nd Dutch division (the others were employing Wellington's characteristic "reverse slope defence"). [lower-alpha 8] Nevertheless, the bombardment caused a large number of casualties. Though some projectiles buried themselves in the soft soil, most found their marks on the reverse slope of the ridge. The bombardment forced the cavalry of the Union Brigade (in third line) to move to its left, as did the Scots Greys, to reduce their casualty rate. The divisions were to advance in echelon from the left at a distance of 400 paces apart — the 2nd Division (Donzelot's) on the right of Bourgeois' brigade, the 3rd Division (Marcognet's) next, and the 4th Division (Durutte's) on the right.They were led by Ney to the assault, each column having a front of about a hundred and sixty to two hundred files. The French advance drove in the British skirmishers and reached the sunken road. As they did so, Pack's men stood up, formed into a four deep line formation for fear of the French cavalry, advanced, and opened fire. However, a firefight had been anticipated and the French infantry had accordingly advanced in more linear formation. Now, fully deployed into line, they returned fire and successfully pressed the British troops; although the attack faltered at the centre, the line in front of d'Erlon's right started to crumble. Picton was killed shortly after ordering the counter-attack and the British and Hanoverian troops also began to give way under the pressure of numbers. Pack's regiments, all four ranks deep, advanced to attack the French in the road but faltered and began to fire on the French instead of charging. The 42nd Black Watch halted at the hedge and the resulting fire-fight drove back the British 92nd Foot while the leading French 45e Ligne burst through the hedge cheering. Along the sunken road, the French were forcing the Allies back, the British line was dispersing, and at two o'clock in the afternoon Napoleon was winning the Battle of Waterloo. Reports from Baron von Muffling, the Prussian liaison officer attached to Wellington's army, relate that: "After 3 o’clock the Duke's situation became critical, unless the succour of the Prussian army arrived soon". The two brigades had a combined field strength of about 2,000 (2,651 official strength); they charged with the 47-year-old Uxbridge leading them and a very inadequate number of squadrons held in reserve. [lower-alpha 15] There is evidence that Uxbridge gave an order, the morning of the battle, to all cavalry brigade commanders to commit their commands on their own initiative, as direct orders from himself might not always be forthcoming, and to "support movements to their front". It appears that Uxbridge expected the brigades of Sir John Ormsby Vandeleur, Hussey Vivian and the Dutch cavalry to provide support to the British heavies. Uxbridge later regretted leading the charge in person, saying "I committed a great mistake", when he should have been organising an adequate reserve to move forward in support. To their left, the Union Brigade suddenly swept through the infantry lines, giving rise to the legend that some of the 92nd Gordon Highland Regiment clung onto their stirrups and accompanied them into the charge. [lower-alpha 17] From the centre leftwards, the Royal Dragoons destroyed Bourgeois' brigade, capturing the eagle of the 105th Ligne. The Inniskillings routed the other brigade of Quoit's division, and the Scots Greys came upon the lead French regiment, 45th Ligne, as it was still reforming after having crossed the sunken road and broken through the hedge row in pursuit of the British infantry. The Greys captured the eagle of the 45th Ligne and overwhelmed Grenier's brigade. These would be the only two French eagles captured by the British during the battle. On Wellington's extreme left, Durutte's division had time to form squares and fend off groups of Greys. As with the Household Cavalry, the officers of the Royals and Inniskillings found it very difficult to rein back their troops, who lost all cohesion. Having taken casualties, and still trying to reorder themselves, the Scots Greys and the rest of the Union Brigade found themselves before the main French lines. Their horses were blown, and they were still in disorder without any idea of what their next collective objective was. Some attacked nearby gun batteries of the Grande Battery. Though the Greys had neither the time nor means to disable the cannon or carry them off, they put very many out of action as the gun crews were killed or fled the battlefield. Sergeant Major Dickinson of the Greys stated that his regiment was rallied before going on to attack the French artillery: Hamilton, the regimental commander, rather than holding them back cried out to his men "Charge, charge the guns!". Jan Willem Pieneman: The Battle of Waterloo (1824). Duke of Wellington, centre, flanked on his left by Lord Uxbridge in hussar uniform. On the image's far left, Cpl. Styles of the Royal Dragoons flourishes the eagle of the 105eme Ligne. The wounded Prince of Orange is carried from the field in the foreground. Some historians, such as Chandler and Weller, assert that the British heavy cavalry were destroyed as a viable force following their first, epic charge. Barbero states that the Scots Grey were practically wiped out and that the other two regiments of the Union Brigade suffered comparable losses. Other historians, such as Clark-Kennedy and Wood, citing British eyewitness accounts, describe the continuing role of the heavy cavalry after their charge. The heavy brigades, far from being ineffective, continued to provide valuable services. They countercharged French cavalry numerous times (both brigades), halted a combined cavalry and infantry attack (Household Brigade only), were used to bolster the morale of those units in their vicinity at times of crisis, and filled gaps in the Anglo-allied line caused by high casualties in infantry formations (both brigades). This service was rendered at a very high cost, as close combat with French cavalry, carbine fire, infantry musketry and—more deadly than all of these—artillery fire steadily eroded the number of effectives in the two brigades. [lower-alpha 23] At 6 o'clock in the afternoon the whole Union Brigade could field only 3 squadrons, though these countercharged French cavalry, losing half their number in the process. At the end of the fighting the two brigades, by this time combined, could muster one squadron. Wellington's infantry responded by forming squares (hollow box-formations four ranks deep). Squares were much smaller than usually depicted in paintings of the battle – a 500-man battalion square would have been no more than 60 feet (18 m) in length on a side. Squares that stood their ground were deadly to cavalry, as cavalry could not engage with soldiers behind a hedge of bayonets, but were themselves vulnerable to fire from the squares. Horses would not charge a square, nor could they be outflanked, but they were vulnerable to artillery or infantry. Wellington ordered his artillery crews to take shelter within the squares as the cavalry approached, and to return to their guns and resume fire as they retreated. — Captain Rees Howell Gronow, Foot Guards. — Captain Cavalié Mercer, RHA. For reasons that remain unclear, no attempt was made to spike other allied guns while they were in French possession. In line with Wellington's orders, gunners were able to return to their pieces and fire into the French cavalry as they withdrew after each attack. After numerous costly but fruitless attacks on the Mont-Saint-Jean ridge, the French cavalry was spent. [lower-alpha 25] Their casualties cannot easily be estimated. Senior French cavalry officers, in particular the generals, experienced heavy losses. Four divisional commanders were wounded, nine brigadiers wounded, and one killed – testament to their courage and their habit of leading from the front. Illustratively, Houssaye reports that the Grenadiers à Cheval numbered 796 of all ranks on 15 June, but just 462 on 19 June, while the Empress Dragoons lost 416 of 816 over the same period. Overall Guyot's Guard heavy cavalry division lost 47% of its strength. — Captain James Shaw, 43rd Foot, Chief of Staff 3rd Division. The success Napoleon needed to continue his offensive had occurred. Ney was on the verge of breaking the Allied centre. Along with this artillery fire a multitude of French tirailleurs occupied the dominant positions behind La Haye Sainte and poured an effective fire into the squares. The situation was now so dire that the 33rd Regiment's colours and all of Halkett's brigade's colours were sent to the rear for safety, described by historian Alessandro Barbero as, "... a measure that was without precedent". Wellington, noticing the slackening of fire from La Haye Sainte, with his staff rode closer to it. French skirmishers appeared around the building and fired on the British command as it struggled to get away through the hedgerow along the road. Alten ordered a single battalion, the Fifth KGL to recapture the farm. Their Colonel Ompteda obeyed and chased off some French skirmishers until French cuirassiers fell on his open flank, killed him, destroyed his battalion and took its colour. A Dutch–Belgian cavalry regiment ordered to charge, retreated from the field instead, fired on by their own infantry. Merlen's Light Cavalry Brigade charged the French artillery taking position near La Haye Sainte but were shot to pieces and the brigade fell apart. The Netherlands Cavalry Division, Wellington's last cavalry reserve behind the centre having lost half their strength was now useless and the French cavalry, despite its losses, were masters of the field compelling the allied infantry to remain in square. More and more French artillery was brought forward. A French battery advanced to within 300 yards of the 1/1st Nassau square causing heavy casualties. When the Nassauers attempted to attack the battery they were ridden down by a squadron of cuirassiers . Yet another battery deployed on the flank of Mercer's battery and shot up its horses and limbers and pushed Mercer back. Mercer later recalled, "The rapidity and precision of this fire was quite appaling. Every shot almost took effect, and I certainly expected we should all be annihilated. ... The saddle-bags, in many instances were torn from horses' backs ... One shell I saw explode under the two finest wheel-horses in the troop down they dropped". The first Prussian corps to arrive in strength was Bülow's IV Corps. Bülow's objective was Plancenoit, which the Prussians intended to use as a springboard into the rear of the French positions. Blücher intended to secure his right upon the Châteaux Frichermont using the Bois de Paris road. Blücher and Wellington had been exchanging communications since 10:00 and had agreed to this advance on Frichermont if Wellington's centre was under attack. [lower-alpha 29] General Bülow noted that the way to Plancenoit lay open and that the time was 16:30. The 24th Regiment linked up with a Highlander battalion on its far right and along with the 13th Landwehr regiment and cavalry support threw the French out of these positions. Further attacks by the 13th Landwehr and the 15th Brigade drove the French from Frichermont. Durutte's division, finding itself about to be charged by massed squadrons of Zieten's I Corps cavalry reserve, retreated from the battlefield. The soldiers of D’Erlon's Corps alongside this attack on Durutte's division also broke and fled in panic, while to the west the French Middle Guard were assaulting Wellington's centre. 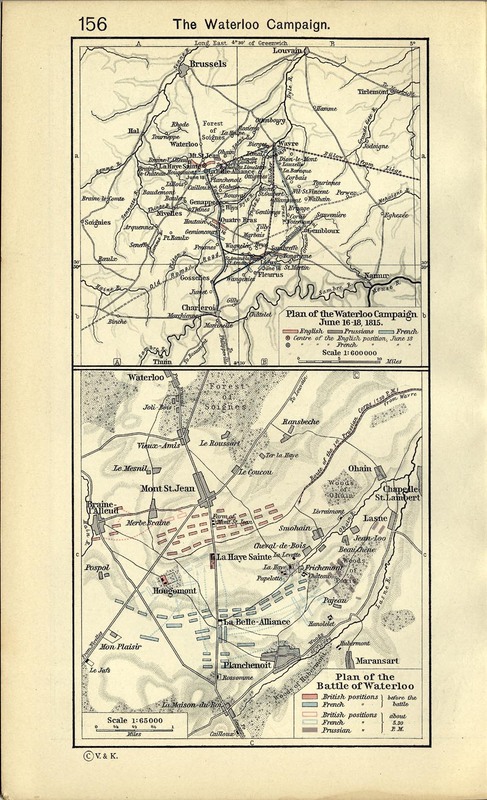 The Prussian I Corps then advanced towards the Brussels road and the only line of retreat available to the French. Napoleon himself oversaw the initial deployment of the Middle and Old Guard. The Middle Guard formed in battalion squares, each about 550 men strong, with the 1st/3rd Grenadiers, led by Generals Friant and Poret de Morvan, on the right along the road, to their left and rear was General Harlet leading the square of the 4th Grenadiers, then the 1st/3rd Chasseurs under General Michel, next the 2nd/3rd Chasseurs and finally the large single square of two battalions of 800 soldiers of the 4th Chasseurs led by General Henrion. Two batteries of Imperial Guard Horse Artillery accompanied them with sections of two guns between the squares. Each square was led by a general and Marshal Ney, mounted on his 5th horse of the day, led the advance. Behind them, in reserve, were the three battalions of the Old Guard, right to left 1st/2nd Grenadiers, 2nd/2nd Chasseurs and 1st/2nd Chasseurs. Napoleon left Ney to conduct the assault, however Ney led the Middle Guard on an oblique towards the Allied centre right instead of attacking straight up the centre. Napoleon sent Ney's senior ADC Colonel Crabbé to order Ney to adjust, but Crabbé was unable to get there in time. Other troops rallied to support the advance of the Guard. On the left infantry from Reille's corps that was not engaged with Hougoumont and cavalry advanced. On the right all the now rallied elements of D'Érlon's corps once again ascended the ridge and engaged the allied line. Of these, Pégot's brigade broke into skirmish order and moved north and west of La Haye Sainte and provided fire support to Ney, once again unhorsed, and Friant's 1st/3rd Grenadiers. The Guards first received fire from some Brunswick battalions, but the return fire of the grenadiers forced them to retire. Next, Colin Halket's brigade front line consisting of the 30th Foot and 73rd traded fire but they were driven back in confusion into the 33rd and 69th regiments, Halket was shot in the face and seriously wounded and the whole brigade retreated in a mob. Other allied troops began to give way as well. A counterattack by the Nassauers and the remains of Kielmansegge's brigade from the allied second line, led by the Prince of Orange, was also thrown back and the Prince of Orange was seriously wounded. General Harlet brought up the 4th Grenadiers and the allied centre was now in serious danger of breaking. It was at this moment that the timely arrival of the Dutch General Chassé turned the tide in favour of the allies. Chassé's relatively fresh Dutch division was sent against them, led by a battery of Dutch horse-artillery commanded by Captain Krahmer de Bichin. The battery opened a destructive fire into the 1st/3rd Grenadiers' flank. This still did not stop the Guard's advance, so Chassé ordered his first brigade (Colonel Hendrik Detmers) to charge the outnumbered French with the bayonet, who faltered and broke. The 4th Grenadiers, seeing their comrades retreat and having suffered heavy casualties themselves, now wheeled right about and retired. To the left of the 4th Grenadiers were the two squares of the 1st/ and 2nd/3rd Chasseurs who angled further to the west and had suffered more from artillery fire than the grenadiers. But as their advance mounted the ridge they found it apparently abandoned and covered with dead. Suddenly 1,500 British Foot Guards under Maitland who had been lying down to protect themselves from the French artillery rose and devastated them with point-blank volleys. The chasseurs deployed to answer the fire, but some 300 fell from the first volley, including Colonel Mallet and General Michel, and both battalion commanders. A bayonet charge by the Foot Guards then broke the leaderless squares, which fell back onto the following column. The 4th Chasseurs battalion, 800 strong, now came up onto the exposed battalions of British Foot Guards, who lost all cohesion and dashed back up the slope as a disorganized crowd with the chasseurs in pursuit. At the crest the chasseurs came upon the battery that had caused severe casualties on the 1st and 2nd/3rd Chasseurs, they opened fire and swept away the gunners. The left flank of their square now came under fire from a heavy formation of British skirmishers, which the chasseurs drove back. But the skirmishers were replaced by the 52nd Light Infantry, led by John Colborne, which wheeled in line onto the chasseurs' flank and poured a devastating fire into them. The chasseurs returned a very sharp fire which killed or wounded some 150 men of the 52nd. The 52nd then charged, and under this onslaught, the chasseurs broke. As dusk fell, both squares withdrew in relatively good order, but the French artillery and everything else fell into the hands of the allies. The retreating Guards were surrounded by thousands of fleeing, broken French troops. Coalition cavalry harried the fugitives until about 23:00, with Gneisenau pursuing them as far as Genappe before ordering a halt. There, Napoleon's abandoned carriage was captured, still containing diamonds left behind in the rush to escape. These became part of King Friedrich Wilhelm of Prussia's crown jewels; one Major Keller of the F/15th received the Pour le Mérite with oak leaves for the feat. By this time 78 guns and 2,000 prisoners had also been taken, including more generals. Other sources agree that the meeting of the commanders took place near La Belle Alliance, with this occurring at around 21:00. However, historian Peter Hofschröer has written that Wellington and Blücher met at Genappe around 22:00, signifying the end of the battle. 22 June. This morning I went to visit the field of battle, which is a little beyond the village of Waterloo, on the plateau of Mont-Saint-Jean; but on arrival there the sight was too horrible to behold. I felt sick in the stomach and was obliged to return. The multitude of carcasses, the heaps of wounded men with mangled limbs unable to move, and perishing from not having their wounds dressed or from hunger, as the Allies were, of course, obliged to take their surgeons and waggons with them, formed a spectacle I shall never forget. The wounded, both of the Allies and the French, remain in an equally deplorable state. — Major W. E. Frye. Napoleon announced his second abdication on 24 June 1815. In the final skirmish of the Napoleonic Wars, Marshal Davout, Napoleon's minister of war, was defeated by Blücher at Issy on 3 July 1815. Allegedly, Napoleon tried to escape to North America, but the Royal Navy was blockading French ports to forestall such a move. He finally surrendered to Captain Frederick Maitland of HMS Bellerophon on 15 July. There was a campaign against French fortresses that still held out; Longwy capitulated on 13 September 1815, the last to do so. The Treaty of Paris was signed on 20 November 1815. Louis XVIII was restored to the throne of France and Napoleon was exiled to Saint Helena, where he died in 1821. — Napoleon. (letter of surrender to the Prince Regent; translation). In my opinion, four principal causes led to this disaster: The first, and most influential, was the arrival, skilfully combined, of Blücher, and the false movement that favoured this arrival;[lower-alpha 37] the second, was the admirable firmness of the British infantry, joined to the sang-froid and aplomb of its chiefs; the third, was the horrible weather, that had softened the ground, and rendered the offensive movements so toilsome, and retarded till one o'clock the attack that should have been made in the morning; the fourth, was the inconceivable formation of the first corps, in masses very much too deep for the first grand attack. Wellington himself wrote in his official dispatch back to London: "I should not do justice to my own feelings, or to Marshal Blücher and the Prussian army, if I did not attribute the successful result of this arduous day to the cordial and timely assistance I received from them. The operation of General Bülow upon the enemy's flank was a most decisive one; and, even if I had not found myself in a situation to make the attack which produced the final result, it would have forced the enemy to retire if his attacks should have failed, and would have prevented him from taking advantage of them if they should unfortunately have succeeded". Despite their differences on other matters, discussed at length in Carl von Clausewitz's study of the Campaign of 1815 and Wellington's famous 1842 essay in reply to it, the Prussian theorist and historian Clausewitz agreed with Wellington on this assessment. Indeed, Clausewitz viewed the battle prior to the Prussian intervention more as a mutually exhausting stalemate than as an impending French victory, with the advantage, if any, leaning towards Wellington. An alternative view is that towards the end of the battle Wellington's Anglo-allied army faced imminent defeat without Prussian help. For example, Parkinson (2000) writes: "Neither army beat Napoleon alone. But whatever the part played by Prussian troops in the actual moment when the Imperial Guard was repulsed, it is difficult to see how Wellington could have staved off defeat, when his centre had been almost shattered, his reserves were almost all committed, the French right remained unmolested and the Imperial Guard intact. …. Blücher may not have been totally responsible for victory over Napoleon, but he deserved full credit for preventing a British defeat". Steele (2014) writes: "Blücher's arrival not only diverted vital reinforcements, but also forced Napoleon to accelerate his effort against Wellington. The tide of battle had been turned by the hard-driving Blücher. As his Prussians pushed in Napoleon's flank. Wellington was able to shift to the offensive". Some portions of the terrain on the battlefield have been altered from their 1815 appearance. Tourism began the day after the battle, with Captain Mercer noting that on 19 June "a carriage drove on the ground from Brussels, the inmates of which, alighting, proceeded to examine the field". In 1820, the Netherlands' King William I ordered the construction of a monument. The Lion's Hillock, a giant mound, was constructed here using 300,000 cubic metres (390,000 cu yd) of earth taken from the ridge at the centre of the British line, effectively removing the southern bank of Wellington's sunken road. — Victor Hugo, Les Misérables. As part of the bicentennial celebration of the battle, in 2015 Belgium minted a 2 Euro coin depicting the Lion monument over a map of the field of battle. France officially protested this issue, while the Belgian government noted that the French mint sells souvenir medals at Waterloo. After 180,000 coins were minted but not released, the issue was melted. Instead, Belgium issued an identical commemorative coin in the non-standard value of 2½ Euros. Legally only valid within the issuing country (but unlikely to circulate) it was minted in brass, packaged, and sold by the Belgian mint for 6 Euros. A 10 Euro coin, showing Wellington, Blücher, their troops and the silhouette of Napoleon, was also available in silver for 42 Euros. Lord Uxbridge's leg was shattered by a grape-shot at the Battle of Waterloo and removed by a surgeon. The artificial leg used by Uxbridge for the rest of his life was donated to a Waterloo Museum after his death. There is also a leg on display at his house, Plas Newydd, on Anglesey. Napoleonic Wars (1803–1815): involved Napoleon Bonaparte's French Empire and a shifting set of European allies and opposing coalitions. ↑ Captain Cavalié Mercer RHA, thought the Brunswickers "...perfect children. None of the privates, perhaps were over eighteen years of age" (Mercer 1891, p. 218). ↑ On 13 June, the commandant at Ath requested powder and cartridges as members of a Hanoverian reserve regiment there had never yet fired a shot (Longford 1971, p. 486). ↑ The straight-line distance from Halle to Braine-l'Alleud, Wellington's far right flank is nearly the same as the straight-line distance from Wavre to Frichermont, Wellington's far left flank, around 8 miles (13 km). ↑ "The hour at which Waterloo began, though there were 150,000 actors in the great tragedy, was long a matter of dispute. The Duke of Wellington puts it at 10:00. General Alava says half-past eleven, Napoleon and Drouet say noon, and Ney 13:00. Lord Hill may be credited with having settled this minute question of fact. He took two watches with him into the fight, one a stop-watch, and he marked with it the sound of the first shot fired, and this evidence is now accepted as proving that the first flash of red flame which marked the opening of the world-shaking tragedy of Waterloo took place at exactly ten minutes to twelve" (Fitchett 2006, Chapter: King-making Waterloo). "...watches had to be set by solar time, this meant that it was rare for two watches to agree... For example, on 9 June, ... the French I Corps had been at Lille, while the IV Corps was at Metz. Assuming an officer had set his watch at noon and then meticulously wound it twice a day but not reset it during the approach march, by the time the two corps reached the vicinity of Waterloo, the I Corps officer's watch would have read 12:40 p.m. at a time when the IV Corps officer's read 11:20 a.m., and it was noon at Waterloo. This is an extreme example, and unlikely to have actually been the case, but it demonstrates the problem quite well" (Nofi 1998, p. 182). ↑ That is, the 1st battalion of the 2nd Regiment. Among Prussian regiments, "F/12th" denoted the fusilier battalion of the 12th Regiment. ↑ Seeing the flames, Wellington sent a note to the house's commander stating that he must hold his position whatever the cost (Barbero 2005, p. 298). ↑ "Lord Hill may be credited with having settled this minute question of fact. He took two watches with him into the fight, one a stop-watch, and he marked with it the sound of the first shot fired ... At ten minutes to twelve the first heavy gun rang sullenly from the French ridge" (Fitchett 2006, Chapter: King-making Waterloo). ↑ The entire 1st brigade of the 2nd Dutch division, that had been on the forward slope during the night, withdrew to a position behind the ridge between the regiments of Kempt and Pack around 12:00 (Bas & Wommersom 1909, pp. 332–333). ↑ Website of current Dutch historian Marco Bijl: 8militia.net;Eenens 1879, pp. 14–30, 131–198; De Jongh, W.A. : Veldtocht van den Jare 1815, Historisch verhaal; in De Nieuwe Militaire Spectator (Nijmegen 1866), pp. 13–27. (This is the original account of Colonel de Jongh, commander of the Dutch 8th Militia. It can be downloaded at the site of Marco Bijl above. ); Löben Sels, Ernst van Bijdragen tot de krijgsgeschiedenis van Napoleon Bonaparte / door E. van Löben Sels Part 4; Veldtogten van 1814 in Frankrijk, en van 1815 in de Nederlanden (Battles). 1842. 's-Gravenhage : de Erven Doorman, pp. 601–682; Allebrandi, Sebastian. Herinneringen uit mijne tienjarige militaire loopbaan. 1835. Amsterdam : Van Kesteren, pp. 21–30;(Allebrandi was a soldier in the Dutch 7th Militia his account is therefore important). ↑ De Bas reprints colonel Van Zuylen's 'History of the 2nd division'. Van Zuylen van Nijevelt was the chief of staff of the 2nd division and located right behind the van Bijlandt brigade during the whole day (Bas & Wommersom 1909, pp. 134–136(vol.2)). He wrote a 32 page report, right after the battle. This report forms the basis of most of the other literature mentioned here: see Bas & Wommersom 1909, pp. 289–352(vol.3). Google Books; Boulger has an English translation of the report (Boulger 1901). ↑ The brigade's losses were very heavy: one French volley at point blank range decimated the 7th and 8th Militia, who had most of their officers killed or wounded, the brigade commander Bijlandt being one of the wounded who had to be evacuated. The two battalions lost their command structure in one stroke. The total of casualties for the whole brigade for the day was around 800 killed and wounded (Hamilton-Williams 1993, pp. 310–311). ↑ Van Zuylen report; he refers to himself as "the chief-of-staff" (Bas & Wommersom 1909, pp. 338–339(vol. 3)). ↑ Some of the retreating troops panicked and fled. This was not to be wondered at in the circumstances. The British troops of the 1/95th battalion, also under great pressure from the French, did the same at the time. This flight did not involve the whole of the Dutch battalions, as has been asserted by some historians. Van Zuylen rallied 400 men, according to his estimate, who were ready to join the counterattack and even captured two French fanions (Bas & Wommersom 1909, pp. 338–341(vol. 3); Hamilton-Williams 1993, pp. 293–295). ↑ Pawly 2001, pp. 37–43; The following letters are used: the accounts of General Kempt, Calvert of the 32nd infantry, Cruikshank of the 79th, Winchester & Hope of the 92nd, Evans (Ponsonby Cavalry brigade) and Clark Kennedy of the Royal Dragoons (Glover 2004, p. [page needed]). These are the only letters that actually state some details about the Dutch and Belgian troops. ↑ The Royal Horse Guards (2 squadrons) were in reserve for the Household Brigade (9 or 10 squadrons strong) but the Union Brigade (9 squadrons) had no reserve (Letter 5, Siborne 1891, pp. 7–10; Letter 16 Glover 2004). The total may have been 18 squadrons as there is an uncertainty in the sources as to whether the King's Dragoon Guards fielded three or four squadrons. Uxbridge implies 4 squadrons (Letter 5 Siborne 1891, pp. 7–10), however, Capt. Naylor of the King's implies 3 when he states he commanded the centre squadron of the regiment (Letter 21, Siborne 1891, pp. 46–47). ↑ An episode famously used later by Victor Hugo in Les Misérables. The sunken lane acted as a trap, funnelling the flight of the French cavalry to their own right and away from the British cavalry. Some of the cuirassiers then found themselves hemmed in by the steep sides of the sunken lane, with a confused mass of their own infantry in front of them, the 95th Rifles firing at them from the north side of the lane, and Somerset's heavy cavalry still pressing them from behind. The novelty of fighting armoured foes impressed the British cavalrymen, as was recorded by the commander of the Household Brigade. ↑ The tale was related, in old age, by a Sergeant Major Dickinson of the Scots Greys, the last British survivor of the charge (Low 1911, pp. 137, 143). ↑ Losses are ultimately from the official returns taken the day after the battle: Household Brigade, initial strength 1,319, killed – 95, wounded – 248, missing – 250, totals – 593, horses lost – 672. ↑ This view appears to have arisen from a comment by Captain Clark-Kennedy of the 1st Dragoons 'Royals', in a letter in H. T. Siborne's book, he makes an estimate of around 900 men actually in line within the Union Brigade before its first charge (Siborne 1891, Letter 35, p. 69). Clark-Kennedy does not, however, explain how his estimate was arrived at. The shortfall of 432 men (the equivalent of a whole regiment) from the paper strength of the brigade is large. However, another officer of the brigade, John Mills of the 2nd Dragoons, says that the effective strength of the brigade did not "exceed 1,200" (Glover 2007, p. 59). ↑ William Siborne was in possession of a number of eyewitness accounts from generals, such as Uxbridge, down to cavalry cornets and infantry ensigns. This makes his history particularly useful (though only from the British and KGL perspective); some of these eyewitness letters were later published by his son, a British Major General (H. T. Siborne). Parts of William Siborne's account was, and is, highly controversial. The very negative light shed on the conduct of the Dutch–Belgian troops during the battle by Siborne, which it should be said was a reasonably accurate reflection the opinions of his British informants, prompted a semi-official rebuttal by Dutch historian captain Willem Jan Knoop in his "Beschouwingen over Siborne's Geschiedenis van den oorlog van 1815 in Frankrijk en de Nederlanden" en wederlegging van de in dat werk voorkomende beschuldigingen tegen het Nederlandsche leger. Breda 1846; 2nd printing 1847. Knoop based his rebuttal on the official Dutch after-battle reports, drawn up within days of the battle, not on twenty-year-old recollections of veterans, like Siborne. Siborne rejected the rebuttal. ↑ Barbero points out that in April the minister informed Wellington that cavalry regiments could allow themselves no more than 360 horses. The text of this memorandum from Torrens to Wellington Barbero refers to is available in Hamilton-Williams, p.75. ↑ Losses are ultimately from the official returns taken the day after the battle: Household Brigade, initial strength 1,319, killed – 95, wounded – 248, missing – 250, totals – 593, horses lost – 672. Union Brigade, initial strength 1,332, killed – 264, wounded – 310, missing – 38, totals – 612, horses lost – 631 (Smith 1998, p. 544). ↑ In a cavalry unit an "effective" was an unwounded trooper mounted on a sound horse. The military term "effective" describes a soldier, piece of equipment (e.g. a tank or aircraft) or military unit capable of fighting or carrying out its intended purpose. ↑ Cavalrymen were not allowed to dismount without orders, so individual initiative in spiking a cannon would have been impossible for any ranker. Each British cannon had a number of headless nails for spiking stored in a box on the gun carriage, so the French would have had the means to disable the guns readily available, had they known (Weller 1992, p. 114). ↑ A number of different mounts could have been ridden by Napoleon at Waterloo: Ali, Crebère, Désirée, Jaffa, Marie and Tauris (Summerville 2007, p. 315) Lozier states it was Désirée (Lozier 2010). ↑ On the contrary, many contradicted this British account vehemently. See e.g.Eenens 1879, pp. 131–198. Google Books; Knoop, W.J. (1847) , "Beschouwingen over Siborne's Geschiedenis van den oorlog van 1815 in Frankrijk en de Nederlanden", en wederlegging van de in dat werk voorkomende beschuldigingen tegen het Nederlandsche leger (2nd ed. ), Breda <templatestyles src="Module:Citation/CS1/styles.css"></templatestyles>; Craan, W.B. (1817), An historical account of the battle of Waterloo, translated by Gore, A., pp. 30–31 <templatestyles src="Module:Citation/CS1/styles.css"></templatestyles> — written in 1816 on the basis of eyewitness accounts does not mention the incident). ↑ Chesney states that Wellington and the Prussians remained in contact and that it was agreed that Bülow followed by Pirch would take the poorer road to "Froidmont" (Frichermont), while Zieten would take the longer northern, but better made, road via Ohain (Chesney 1874, pp. 173–178). ↑ The attacking battalions were 1st/3rd and 4th Grenadiers and 1st/3rd, 2nd/3rd and 4th Chasseurs of the Middle Guard; those remaining in reserve were the 2nd/2nd Grenadiers, 2nd/1st and 2nd/2nd Chasseurs of the Old Guard (Adkin 2001, p. 392). ↑ Through the finality of Napoleon's defeat, "met his/her Waterloo" has entered the English lexicon as a phrase to describe someone's circumstances when they have met with absolute and final defeat. ↑ Napoleon's last escapade was important politically," because it "compelled all the powers at Vienna to bury their remaining differences in order to achieve a peace which would enshrine the principles of the balance of power" (Kennedy 1987, p. 37). "No international disturbance comparable in magnitude...has ever been followed by such a protracted period of peace" (Palmer 1956, p. 420). Recovering, after Waterloo, from six decades of abnormal obstacles to transatlantic commerce (from the Seven Years War onwards), increasingly industrialized Europe and North America, by 1914, accounted for over 90% of global coal, iron and steel production and 76% of international trade (Paxton 1985, p. 2). ↑ Jomini was Swiss, but was an officer, eventually a general, in the French army and had served on the staff of Marshal Ney. He later served in the Russian Army. ↑ This "false movement" was the detachment of Grouchy's force in pursuit of the Prussians: Napoleon had overestimated the extent of his victory at Ligny and underestimated the resilience of the Prussians. He also seems to have discounted the presence of Bülow's substantial corps, which had not been in action at Ligny. Had Napoleon retained Grouchy's 30,000 men as a guard for his right flank, it is likely that these troops could have held off the Prussians and allowed the rest of Napoleon's army to attack Wellington's army unmolested. ↑ Hofschröer 1999, p. 61 cites Siborne's numbers. ↑ Hamilton-Williams 1994, p. 256 gives 168,000. ↑ 4.0 4.1 Barbero 2005, pp. 75–76. ↑ 7.0 7.1 Barbero 2006, p. 312. ↑ Hamilton-Williams 1993, p. 59. ↑ 14.0 14.1 Chandler 1966, pp. 1016, 1017, 1093. ↑ Siborne 1895, p. 82. ↑ Hofschröer 2005, pp. 136–160. ↑ Herold 1967, pp. 53, 58, 110. ↑ Longford 1971, p. 508. ↑ Chesney 1874, p. 144. ↑ Chesney 1874, pp. 144–145. ↑ Longford 1971, p. 527. ↑ Barbero 2005, p. 75. ↑ Hofschröer 1999, p. 68 gives 73,000. ↑ Glover 2014, p. 30. ↑ Longford 1971, p. 485. ↑ Longford 1971, p. 484. ↑ Barbero 2006, p. 19. ↑ Hamilton-Williams 1993, pp. 239–240. ↑ Hofschröer 2005, p. 59. ↑ 30.0 30.1 30.2 Hofschröer 2005, pp. 60–62. ↑ 31.0 31.1 Barbero 2005, pp. 78–79. ↑ Barbero 2005, p. 80. ↑ 33.0 33.1 Barbero 2005, p. 149. ↑ Parry 1900, p. 58. ↑ Barbero 2005, pp. 141, 235. ↑ Barbero 2005, pp. 83–85. ↑ Barbero 2005, p. 91. ↑ Longford 1971, pp. 535–536. ↑ Barbero 2005, p. 141. ↑ Longford 1971, p. 547. ↑ Roberts 2001, pp. 163–166. ↑ Barbero 2005, p. 73. ↑ Roberts 2001, p. xxxii. ↑ Longford 1971, p. 548. ↑ Bonaparte 1869, pp. 292–293. ↑ Fletcher 1994, p. 20. ↑ Barbero 2005, pp. 95–98. ↑ Roberts 2005, p. 55. ↑ Wellesley 1815, To Earl Bathurst. Waterloo, 19th June 1815. ↑ Barbero 2005, pp. 113–114. ↑ Thiers 1862, p. 215. ↑ Lamar 2000, p. 119. ↑ Booth 1815, p. 10. ↑ 54.0 54.1 Creasy 1877, Chapter XV. ↑ Longford 1971, pp. 552–554. ↑ Barbero 2005, p. 298. ↑ Barbero 2005, pp. 305, 306. ↑ Roberts 2005, p. 57. ↑ Barbero 2005, p. 131. ↑ Hamilton-Williams 1993, p. 286. ↑ Hamilton-Williams 1993, p. 287. ↑ Barbero 2005, p. 136. ↑ Barbero 2005, p. 145. ↑ Cornwell 2015, Those terrible grey horses, how they fight. ↑ 65.0 65.1 65.2 65.3 Haweis 1908, p. 228. ↑ Hamilton-Williams 1993, pp. 289–293. ↑ Barbero 2006, pp. 134–138. ↑ Hamilton-Williams 1993, pp. 296–297. ↑ Barbero 2006, p. 138. ↑ Uffindell & Corum 2002, p. 211. ↑ 72.0 72.1 72.2 Barbero 2006, pp. 140–142. ↑ 73.0 73.1 Adkin 2001, p. 217. ↑ Anglesey 1990, p. 125. ↑ Grant 1972, p. 17. ↑ Oman & Hall 1902, p. 119. ↑ Barbero 2005, p. 188. ↑ Glover 2004, p. Letter 16: Frederick Stovin (ADC to Sir Thomas Picton). ↑ Siborne 1891, Letter 5, pp. 7–10. ↑ Barbero 2005, p. 426, note 18. ↑ Siborne 1895, pp. 410–411. ↑ Houssaye 1900, p. 182. ↑ Barbero 2013, p. 160. ↑ Barbero 2005, pp. 198–204. ↑ Barbero 2006, p. 155. ↑ 86.0 86.1 Hamilton-Williams 1994, p. 304. ↑ Wooten 1993, p. 42. ↑ Barbero 2005, p. 211. ↑ Fletcher 1999, p. 252. ↑ Hamilton-Williams 1994, pp. 303–304. ↑ Siborne 1895, pp. 425–426. ↑ Hofschröer 1999, p. 86. ↑ Barbero 2005, pp. 219–223. ↑ For initial strengths (Adkin 2001, p. 217). ↑ 95.0 95.1 Barbero 2006, pp. 142–143. ↑ Siborne 1895, pp. 329, 349 (composition of brigades); pp. 422–424 (actions of brigades). ↑ Barbero 2006, p. 164. ↑ Siborne 1891, Letters: 18, 26, 104. ↑ 99.0 99.1 99.2 Clark-Kennedy 1975, p. 111. ↑ Fletcher 2001, pp. 142–143. ↑ Wood 1895, pp. 164, 171. ↑ Siborne 1891, p. 38. ↑ Anglesey 1990, p. 144. ↑ Cotton 1849, pp. 90–91. ↑ Siborne 1891, Letters 9, 18, 36. ↑ Anglesey 1990, p. 146. ↑ Clark-Kennedy 1975, pp. 110–111. ↑ 108.0 108.1 Wood 1895, p. 177. ↑ Fletcher 1999, p. 270-271. ↑ Siborne 1891, p. 39. ↑ 111.0 111.1 Esposito & Elting 1999, p. 354, Map 166. ↑ Barbero 2006, p. 156. ↑ Siborne 1895, pp. 443–449. ↑ Adkin 2001, p. 356. ↑ Siborne 1895, pp. 444, 447. ↑ Adkin 2001, pp. 273, 414. ↑ 117.0 117.1 Adkin 2001, p. 359. ↑ Gronow 1862, The Duke of Wellington in our square. ↑ Weller 1992, pp. 211,212. ↑ Adkin 2001, pp. 252,361. ↑ Mercer 1870a, pp. 313–315. ↑ Mercer 1870a, p. 321. ↑ Houssaye 1900, p. 522. ↑ 124.0 124.1 Adkin 2001, p. 361. ↑ Siborne 1891, pp. 14, 38–39. ↑ Siborne 1891, pp. 14–15 and letters 6,7 and 9. ↑ Siborne 1895, p. 465. ↑ Simms 2014, pp. 59–60, 63–64. ↑ Beamish 1995, p. 367. ↑ Siborne 1895, p. 483. ↑ Siborne 1895, p. 484. ↑ Barbero 2006, p. 236. ↑ 133.0 133.1 Hofschröer 1999, p. 134. ↑ 134.0 134.1 Barbero 2006, p. 234. ↑ Barbero 2006, p. 241. ↑ 136.0 136.1 Barbero 2006, pp. 235–236. ↑ Mercer 1870a, pp. 325–326. ↑ Barbero 2006, pp. 239. ↑ Cotton 1849, pp. 106–107. ↑ Barbero 2006, p. 240. ↑ 141.0 141.1 Barbero 2006, p. 242. ↑ 142.0 142.1 Hofschröer 1999, p. 116. ↑ Hofschröer 1999, p. 95. ↑ Hofschröer 1999, p. 117. ↑ 145.0 145.1 Hofschröer 1999, p. 122. ↑ 146.0 146.1 Hofschröer 1999, p. 125. ↑ Uffindell & Corum 2002, p. 232. ↑ Uffindell & Corum 2002, p. 233. ↑ 149.0 149.1 Hofschröer 1999, p. 139. ↑ 150.0 150.1 Hofschröer 1999, p. 140. ↑ Hofschröer 1999, p. 141. ↑ Uffindell & Corum 2002, pp. 232–233. ↑ Chesney 1874, pp. 187–190. ↑ Adkin 2001, p. 391. ↑ Booth 1815, pp. 73,74. ↑ Field 2013, pp. 191–192. ↑ Field 2013, pp. 196–199. ↑ Field 2013, p. 199. ↑ Field 2013, p. 200. ↑ Field 2013, pp. 203. ↑ Chesney 1874, pp. 214–215. ↑ 164.0 164.1 164.2 Parry 1900, p. 70. ↑ Siborne 1895, pp. 553–559. ↑ 167.0 167.1 167.2 167.3 Hofschröer 1999, pp. 144–145. ↑ Kincaid 2006, p. 435. ↑ Hofschröer 1999, p. 149. ↑ 172.0 172.1 Hofschröer 1999, p. 151. ↑ Hofschröer 1999, p. 150. ↑ Booth 1815, p. 74. ↑ Booth 1815, p. 23. ↑ Davies 2012, p. 244. ↑ Corrigan 2006, p. 327. ↑ Frye 2004, June 22. ↑ 180.0 180.1 The London Gazette: no. 17028. p. 1213. 22 June 1815. Retrieved 19 May 2010. ↑ Hofschröer 1999, pp. 274–276,320. ↑ Booth 1815, p. 57. ↑ Barbero 2006, p. 264. ↑ Jomini 1864, pp. 223,224. ↑ Clausewitz & Wellington 2010, Campaign of 1815 and Wellington's famous 1842 essay. ↑ Clausewitz & Wellington 2010, pp. 144–145 (Chapter 41 of Clausewitz's Feldzug). ↑ Parkinson 2000, pp. 240–241. ↑ Steele 2014, p. 178. ↑ Mercer 1870a, p. 345. ↑ Hugo 1862, Chapter VII: Napoleon in a Good Humor. ↑ 195.0 195.1 Hoorebeeke 2007, pp. 6–21. Bonaparte, Napoleon (1869), "No. 22060", in Polon, Henri; Dumaine, J., Correspondance de Napoléon Ier; publiée par ordre de l'empereur Napoléon III (1858), 28, pp. 292, 293 <templatestyles src="Module:Citation/CS1/styles.css"></templatestyles>. Shepherd, William R. (1923), "Map of the battlefield", Historical Atlas, New York: Henry Holt and Company <templatestyles src="Module:Citation/CS1/styles.css"></templatestyles> The map from the 1911 edition is also available online. The London Gazette: no. 17037. pp. 1359–1362. 8 July 1815. Retrieved 13 February 2008. Casualty returns. Staff (9 July 2013), British military campaign and service medals, The [British] National Archive <templatestyles src="Module:Citation/CS1/styles.css"></templatestyles> — "For records of medals awarded for service before 1914, search by name on the Ancestry website. There are separate search pages for the Army (sourced from WO 100)..."
Wikimedia Commons has media related to Battle of Waterloo. "Guides 1815" (in français). 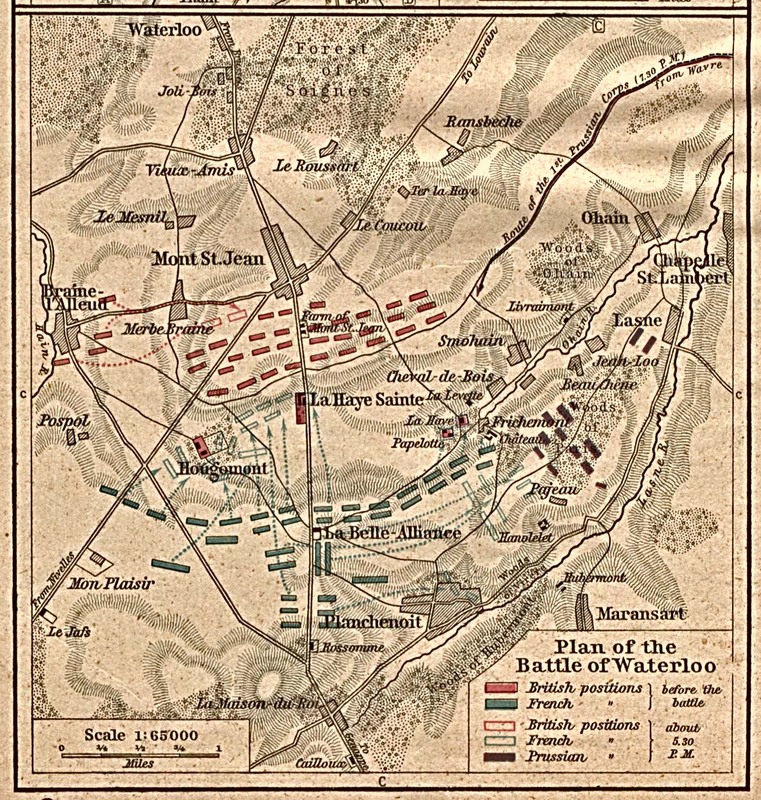 <templatestyles src="Module:Citation/CS1/styles.css"></templatestyles> Official guides of the Waterloo battlefield. This page was last modified on 21 June 2018, at 19:34.